I’m finally making a return visit to the Salon after a few weeks away. Those weeks have been fairly full. A short visit to San Francisco (and its art museums) was part of the mix. Writing program notes for the Reno Chamber Orchestra’s annual Nevada Chamber Music Festival was also a time and energy devourer – ten concerts worth of research and note taking, and 9,000+ words of actual writing, in less than two weeks. Those notes will be available at the Reno Chamber Orchestra website later this week. Add in grading piles of papers for my Music Appreciation class, and the full-time job, and … just writing about it makes me tired and ready for a nap. Spending a goodly amount of time with the Asian Art Museum’s exhibition Out of Character: Decoding Chinese Calligraphy was quite inspiring. It’s a world of art and artists with which I was completely unfamiliar. Now I’m working my way through the exhibition catalog. So don’t be surprised if in the coming days, there are a number of calligraphy-related posts. Exploring both the work and the lives of great artists like Zhao Mengfu and Dong Qichang should be enlightening and entertaining. The Jasper Johns: Seeing with the Mind’s Eye exhibition at SFMOMA is also well worth your time if you’re in the neighborhood. His work is much, much more than the familiar, ubiquitous targets and flags, which are in fact but a very small part of the exhibition. 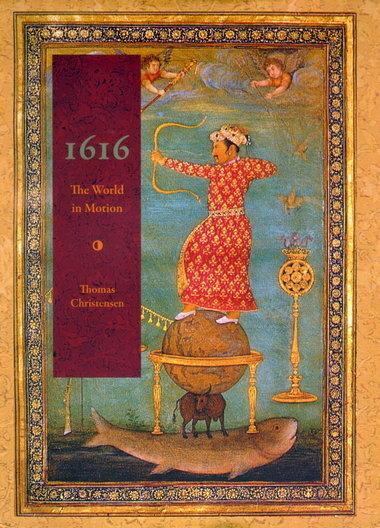 After taking far too much time to do so, I’ve finally completed and written about 1616: The World in Motion by Thomas Christensen (who happens to be Director of Publications at that same Asian Art Museum). It’s a great, fact-packed read with many beautiful reproductions of art works. The books and compact discs and DVDs and Blu-Rays keep accumulating on my shelves, and couch, and floor, and just about every other available surface on which I might pile things. Who knows where my attention will land next – certainly not me. But through this blog, if I behave myself and post regularly, you’ll find out not long after I do. Enjoy your week! His Prologue lands us in the court of James I of England on the first day of 1616. James is about to witness a performance of Ben Jonson’s The Golden Age Restored, a masque (a stage play incorporating elaborate costumes, scenery, and dancing) that depicts the reform of a corrupt world by Jove, the king of Heaven, and the goddess Pallas Athena. Christensen uses this masque as a frame in which to discuss that fragile, rapidly changing time, where culture after culture, while welcoming progress, also longed to return to the stability and grandeur of the past. — Wang Wei (699-759), translated by Jonathan Chaves in Out of Character: Decoding Chinese Calligraphy. See this poem in semicursive script calligraphy by Zhang Ruitu (1570-1641) here.